Edit many time entries at once by using the bulk edit option. 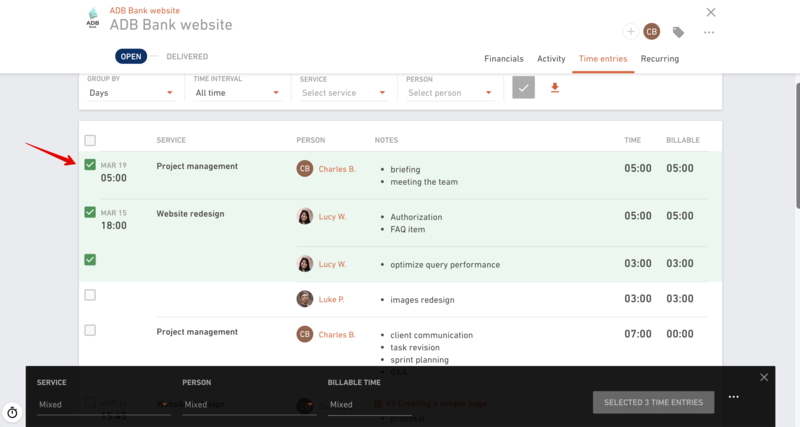 Change billable time in bulk or move time to different service easily. If you want to make changes to many time entries at once, you can do that on any Time entries screen in your Productive account. In the example below, we are editing time entries on budget level. First things first, click on the checkbox on any individual time entry, to open up the multiple select option. There's also a fourth option, hidden under the "3 dots" on the right side of the footer. This will open up the delete functionality, which will allow you to delete all selected time entries.